COST INCLUDES : Training with your camera ( for Workshop participants), transportation to & information on all Tuscany & Cinque Terre Sightseeing locations, 6 nights accommodation, ALL breakfasts, transfers from and to airport. TUSCANY... old world Italy at its finest. Misty shadows slow-dancing across quiet green valleys at sunrise. Walled medieval villages that sit high on hilltops overlooking the vineyards and olive groves that grace this beautiful land. An endless array of Tuscan portals - doors, windows, and streets adorned with flowers through the pride of its loyal residents. And the quintessential cypress trees identify postcard scenes that we will view. You will be guided to ancient hilltop villages such as Montepulciano, Pienza, San Quirico, Monticchiello, Montalcino, Siena, San Gimignano and other unique landscape gems there. Our home base in Tuscany is usually a choice of several Agriturismos, such as Podere Spedalone (click on its link in the page menu above), where Alessandro and the team will welcome and pamper our group in an ancient working farmhouse. Each day in between our morning & evening photo shoots ( or sightseeing excursions), you will have the opportunity to relax poolside, freshen up, or catch a quick nap , before we explore the late afternoon in another hilltown choice, & the sunset "golden hours." Not only will you shoot or visit the best locations, but daily we will visit family-run restaurants that prove the distinctive difference of FRESH Tuscan ingredients. These meals will be a major highlight of your Italy experience...and fun ! Use the "contact" link in the menu above to request a RESERVATION booking form. The Groups & Workshops are limited to a maximum of 6 - 7 people to insure individual attention, so book early with a min. deposit to assure a spot ! After the Group/Workshop limit is reached, a wait list will be available if cancellations occur. 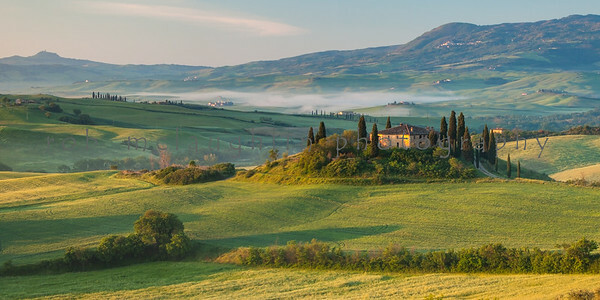 What will a day be like in our Tuscany Photography Workshop ? The itinerary for the week primarily will flow with the desires of YOU and your fellow photographers, and adjust based on the next day's weather forecast. We will discuss as a group, at our first night welcoming meal, the available blend of landscapes, street scenes, architecture, and sunrise/sunsets. If a further town such as San Gimignano, Siena, Assisi, or Cortona is agreed upon, we will go there too ! This is YOUR workshop. A typical day would involve a short morning drive to catch a sunrise, or first light burning off the mist in the Orcia valley ( sleep-in if you prefer on one of the days), and return after an hour to our farmhouse for breakfast and a shower. Then head out in a different direction to shoot street scenes maybe in Pienza, where the aroma of Pecorino cheese draws you into their shops. Or in Montepulciano, we can watch the renowned Cesare Mazzettti constructing coppersmith products, which you can request & purchase in his wife Yolanda's shop; truly a master artisan ! And there's always time for a light lunch, shopping, ... and gelato ! As we drive on, landscapes & flowers pop up, so I stop, & you shoot what you like. Eventually we swing by our farmhouse in mid-afternoon to choose between a brief nap, dip in the pool, or relaxed photo questions. Then we head out for more late afternnoon shadows & gorgeous sunsets, before feasting on a FRESH 4 course Tuscan cuisine at either our Spedalone farmhouse with Alessandro, or at my favorite trattoria, Latte di Luna in Pienza. I am addicted to their homemade Pici all'Aglione, and they are famous for their succulent maialino arrosto (roasted suckling pig). You'll hear "Era squisito !" often that week & will become spoiled quickly by the FRESHNESS & FLAVORS, not wanting to return home. La dolce vita !